MPC programs are designed to help grantmakers learn and develop expertise. MPC provides programs and offers workshops to share the skills needed for foundations and giving programs to be meaningful and effective. If you have any idea for a program, please let us know. MPC grantmaker programs are designed specifically for grantmakers, foundation staff, trustees and donor advisors. The Maine Philanthropy Center is pleased to announce a special four-part conversation series led by highly respected philanthropic advisor Peter Lamb, focused on the unique perspectives of small family foundations, individual philanthropists, and donor advisors. This series will span from fall 2015 through spring 2016. The Funders Forum provides MPC's grantmaker members the opportunity to meet and reflect on the issues crucial to our work. 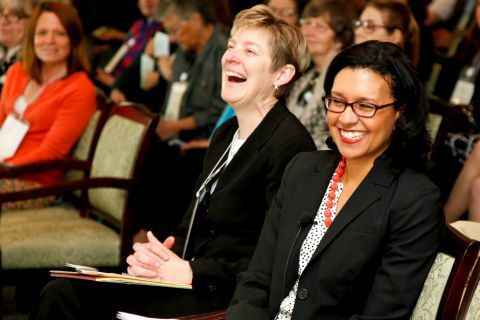 Build connections with Maine philanthropy colleagues, share successes and challenges, and learn about what's happening in the broader philanthropy world. Attendees of the 2015 Funders Forum will get a first view of the Maine grant maps from the Foundation Center (early results from our Get on the Map campaign! ), explore and weigh in on the public policy task force recommendations, and dig in to what diverse, inclusive, and equitable work means for the Maine philanthropic community.